If we were having coffee today I’m sure I’d wish you a happy new year. It’s something we all do. Seriously, I don’t care much about the philosophy of the new year. I understand the importance of noting the passage of time but celebrating the change? Really? It’s always seemed to be something of an arbitrary thing to me. But people like it so I go along with it. Speaking of heart transplants, I found out as I started typing this that a good friend of my wife, Kelly Wagner, received a new heart yesterday in Maryland. She has also suffered from a debilitating heart condition for a very very long time. Please send your prayers and good wishes her way as she recovers. With two such momentous bookends to the year, my own struggles have seemed insignificant. I started the year seeing clearly … and I’ve already referenced the degradation of my eyesight due to cataracts. My last surgery was complete December 1 and I am seeing very well, thank you. I got up early this morning to watch the space station pass … it was an outstanding viewing and I was quite grateful that I could completely enjoy it. In October our daughter got married, another event I partially chronicled in this blog … preparations for that wedding took up the rest of our spare time (and money!) for months and months. The wedding was lovely. What the heck are we going to do with all those shoes? In the middle of everything else, I published my second novel. So far, the response has been lackluster, but all I can do is just keep writing and hope that readers will realize what a good story it is and that the combination of the two books (along with the 2015 debut novel) is an entertaining bit of reading. I have managed to attract a smattering of very loyal fans and I am grateful for that. My eye trouble sort of got in the way of starting book 3, but I’m ready to start hammering away at the keyboard again. Or maybe I should revise one of my other three completed drafts on different subjects? Hmmmm. All-in-all it was a fairly good year. I know 2017 has a lot of question marks looming but my suggestion is to just set your own expectations low and keep things close to your heart and simple. Here’s wishing you a happy and safe transition to that arbitrary delineation we call the new year. They are both available in paperback from Amazon, Barnes & Noble, and Createspace and in ebook form from Amazon, Barnes & Noble, Kobo, and for iBooks. Links for all of those are on the web page. Happy New Year. 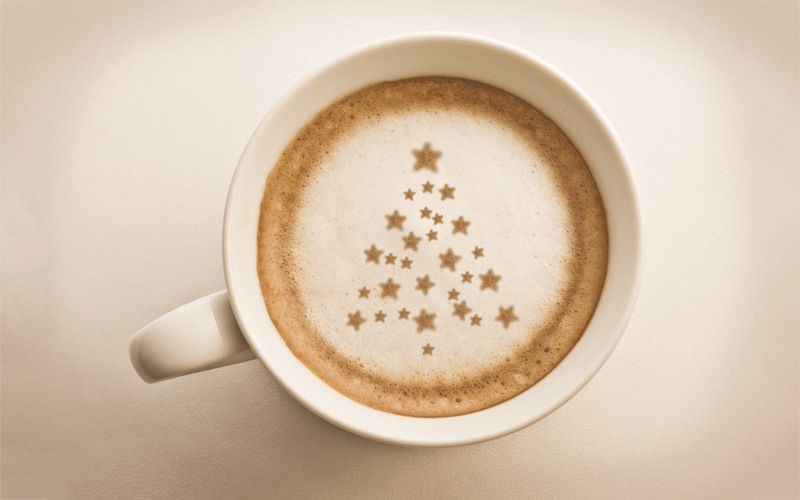 If we were having coffee today, Friday the twenty-third, I’d wish you a Happy Christmas Eve-Eve. The day figures prominently in my novel, The Fever. In fact the entire Christmas week is a big part of the story. In the book, the day has been celebrated by several of the characters as both a Christmas celebration and the commemoration of a shared tragedy — the destruction of their old workplace by a fire-bombing. It was a bar called Trotsky’s. No one knew if it was radical right-wingers lashing out at a perceived symbol of Communism, or radical leftists intent on preserving the memory of a revered servent to the cause. Really, it was just a bar with a catchy name. The “holiday” concept was born out of my own usage of the term when I used to host an informal get-together as a chance to celebrate with friends before they headed home for the holidays. Ironically the day has gained some traction as “Festivus” from a Seinfeld episode. Ah, but another sitcom, New Girl, has just aired an episode about Christmas Eve-Eve. I an glad I put it in the book, so if it takes off you’ll all know where it originated. So, Happy Christmas Eve-Eve! And also, a warm Season’s Greetings to you and yours. If we were having coffee today I’d lament the rapid onset of Christmas and the dearth of book sales, then tell you of recent events. Yes, Christmas is coming with all the good, the bad, and the ugly. Well, mostly the former, I guess, but after all the wedding hoopla earlier in the year the holidays are almost an anti-climax. Plus the kitten we acquired last spring has precluded worrying too much about a Christmas Tree. The bigger cats are problem enough but a rambunctious youngster makes us a little edgy about putting up a feline jungle gym for her. We had a number of decorative lighted trees we bought for the wedding, so we have several of those placed around the den and living room and have decorated them with small, light decorations. Yes, we are using leftover wedding stuff for Christmas decorations. I even have one of those lighted trees in an upstairs bedroom window facing the street, serving up a “lighted tree in a window” effect. We might still augment the house with a traditional tree, or, we might not. This weekend will tell. I spoke a while back about my vision problems with cataracts. I’m happy to report that I am now seeing very well. The first surgery was November 10 and the second one was December 1. My doctor put me on a strict no lifting anything over 10 pounds regimen after both surgeries so that impacted the Christmas decorating thing too, because I couldn’t mess with a tree or risk climbing into storage to fiddle with the boxes of ornaments. Then my lovely bride has been having some back issues and this is affecting our shopping too, as is my job, which has been kicking up a lot of dust this week. Now I’m starting to understand why my grandparents always just gave us a check. I hope to make fruitcake tonight or tomorrow. My family has made this same recipe for over 100 years. This is not a stereotype either … it is a GOOD fruitcake. The full recipe makes about 1.5 metric tons. For years I’ve made a half batch and even that is so big I had to buy a restaurant quality huge metal mixing bowl. Since each slice is a little calorie bomb, I decided to cut it down again, so I’m making a 1/4 batch, which should make one nice sized cake. In the past I’ve mostly made cupcakes … fruitcake cupcakes are genius (my mom’s idea) but you lose one thing, the marvelous calliope of colors and textures one gets when a fruitcake is sliced. At least in theory. I might go back to cupcakes next year. They really are pretty cool and easier to store. Oh, yeah, I have been lamenting something else too … book sales have really dropped off. Luckily, they didn’t have far to go. Ah well … I’ll just keep hammering away. Still, allow me a moment to plug for sales… do you need a last minute gift idea? Take a minute to scan through my web page … the URL is below. There is a review link … several book review bloggers have read them and given me some awesome reviews. People who read these books really like them.